The UK’s Telegraph has an article comparing Burning Man with the rise of the social media network Ello (I’m @zos). It seems social media has become full of squares and obsessed with monetization; so the cool kids are looking for something new. Last year, two square, but great, friends of mine announced they were going to the Burning Man festival in Nevada’s Black Rock desert. Of course they were entitled to do so, but my first thoughts were that if people like that were going, then Burning Man was over as a out-there festival. 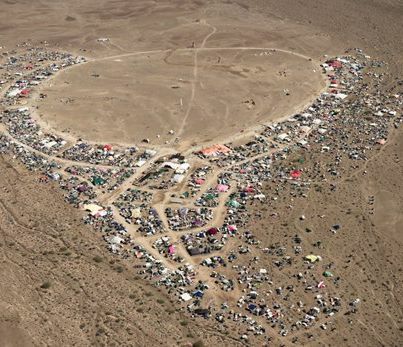 Not only was it time to turn to the infinitely more interesting AfrikaBurn in South Africa’s Tankwa Karoo, but it also minded me of other people’s adoption of social media, especially Twitter. It was only a matter of time before all the early day Cassandras and piss-takers finally joined Twitter, but now that they’ve done so along with most reasonably educated people, perhaps it is time to turn to the AfrikaBurn equivalent of Twitter’s Burning Man and find another medium to operate within. The recent emergence of trending, invitation-only, ad-free and minimalist social network Ello is a case in point. Its founder Paul Budnitz pulls no punches in his company’s attitude towards a network such as Facebook. “We believe in beauty, simplicity and transparency. We believe that the people who make things and the people who use them should be in partnership. We believe a social network can be a tool for empowerment. Not a tool to deceive, coerce and manipulate – but a place to connect, create and celebrate life,” he says. ​…Twitter needs to monetise and the recent announcement by its CFO Anthony Noto at a financial conference that it will introduce a Facebook-style feed filtered algorithmically because Twitter believes it KNOWS what is important to you, does not augur well. Twitter’s desperation to monetise means that existing Twitter lovers will feel that adoration slowly dribble away. New users, such as past-it-Burning-Man-attendees won’t care about this; people like us will. It’s like being a mobile operator customer for a decade and then finding out new subscribers are receiving deals you were never offered and never dreamt about. …The same goes for brands on Facebook. The much-derided ‘Likes’ metric may have had its day, but even so brands still need to have a minimum of ‘Likes’ to feel authentic in front of a social audience. Even so, there appears to be on Facebook a ‘10,000 rule’, rather like the so-called 10,000 hours that must be practised before somebody becomes sufficiently accomplished at a craft. …“Our graphs show that not only does reach decline after 10,000 likes, but the bottom line is that even though you could put in significant efforts to grow your Facebook ‘status’, an algorithm change on Facebook’s side could wipe out your efforts anyway”, he says. …Twitter [launched] The Dots, a ‘LinkedIn for creatives’, so the Social Media 2.0 bandwagon is continuing to attract new caravanners as much as the ​aforesaid ​Burning Man festival is losing the cool factor. Ello and Dots are just the beginning. Whether they are the new Facebook or Twitter remains to be seen, but the one thing that is certain that I’ll be at AfrikaBurn in South Africa next April. Maybe I’ll invite my square mates ​along ​and send them an invitation to Ello at the same time. Thus the circle will be squared. And Ello (which has VC funding, by the way, meaning there’s an expectation of return on investment sometime in the future) will remain ad-free until either it isn’t, or it folds, just like every other social media platform. It won’t be able to scale without revenue, unless it gets some very deep-pocketed and idealist benefactors. So in a way, your analogy is very apt. Burning Man could have remained idealistically pure and would have blown away in the dust by about 2001 or so, unable to scale up to accommodate its growing user base. Instead, the BMORG made some real-world, big-boy pants compromises to keep the event growing. Again, I fully get the people who prefer that not to have happened. But I’m glad it did. Back to Ello; it will absolutely monetize in one form or another. Venture capitalists don’t invest money in a company that has no plans to do so. Although I agree, AfrikaBurn looks awesome. “The only way to fight the venture capital model is not to support the product in the first place. Venture capital is private subsidy that keeps the startup alive long enough until enough people have joined their platform. At this point, it’s too late. By being part of the platform we have created its value. This is the value that is sold in an exit. The only way to resist this system is to not build that value in the first place. Once a network has grown to the sort of size Facebook or Twitter has, there is very little anyone can do. But we have an opportunity to make sure that new networks that are funded by venture capital do not reach that point. “I’m sorry, Paul, but by taking venture capital you have made a crucial mistake that is incompatible with the goals you set out in your manifesto and I will not support yet another venture-capital funded network only to be disappointed at the time of the inevitable exit. “So here’s what I’m doing: I’m leaving Ello. Before it can grow. Before it can exit. And I suggest that you do the same. interesting. What if there was no exit? An open, transparent system, fair and accountable…a digital community with permanence built in? Just another Utopian dream? Or could someone actually design something like that? Even if someone could design something, could Burners build it? Would the do-ers do it? Would they care enough about the world to want to? That would require a design which offers the user a comfortable experience, and any of attempts so far (diaspora, friendica, etc) have not been easy to use.